Discussion in 'UFOs, Aliens, Monsters, and the Paranormal' started by Mick West, Dec 16, 2017. I agree. These "pilots" might also, for example, be voice actors. Excellent point! What data was used to rule out that the audio recording of the alleged "pilots" isn't fake? None. That's why the discussion is concentrating specifically on the video footage. On the other hand, I don't think we have any particular reason to suspect the audio is faked, but given the people involved in the TTSA enterprise and its "mission", it could very well be. There's info about the autotracker in SPIE and patents. Another challenge our tracker faced was image rotation. While our inertial stabilization maintained the sensor fixed on the designated target as the aircraft maneuvered, the image on the display was optically rotated for the operator in order to achieve the effect of looking out the cockpit window. As the aircraft maneuvers, therefore, the image that the tracker receives rotates accordingly. While the centroid track algorithm is able to compensate for the rotation with relative ease, the correlation track algorithm relies on a recursively smoothed reference map to compute track errors. If the scene is rotating, the reference map will smear and degrade(2) . To resolve this issue, we needed to de-rotate the input image before it was smoothed into the reference map. We accomplished this by passing the rotation angle from the Servo Controller to the Image Processor (via the Command and Data Processor), and then de-rotating the input image with respect to the reference image during computation of the track metrics. Bang! As I understand it, "image rotation" is used as a term to specifically mean correcting the gimbal-camera output to the user's orientation. I had predicted the rotation we observe as LOS approaches 0˚ might be driven by an expected-target-location algorithm, and in fact the tracking system has a "track position prediction routine" used to produce the optimal user experience. L. Stephan, J. E. Albus, J. R. Marcovici,“Fitts correlation tracking fidelity in presence of target translation, rotation,and size change”, SPIE Acquisition, Tracking and Pointing XV1, Michael K. Masten, Larry A. Stockum, Editors,Proc. SPIE 4714, SPIE, Orlando, Florida, To be published 2002. According to Jeremy Corbell, talking in this recent video, the Gimbal UFO encounter happened in 2015. "It was a completely separate series of events that has not been clarified by the department of defense or by anybody.. and I will just say because it's going to come out soon.. I have a number of sources that obviously I work with over these years.. That video; the Gimbal one is from a separate series of events and I'll say it's off the East Coast and it's actually only 3 years old. It was early in 2015." the Bermuda Triangle is off the East Coast just saying. Nice! I've added this to the OP. What's driving this flare rotation, a camera rotation or the changing angle of the source? I'd think the latter wouldn't be sufficient to do it, but there's an easy impression or illusion that the rotation is tied to the source's changing angle. From Jane's F/A-18 Flight Manual. But I can't find a date for that publication. We can see changes in the ATFLIR between the 2004 Nimitz and 2015(alleged) gimbal footage, and here we see a setting not listed in the other sources, ENAR. And true to its name, providing an even more narrowed FOV of 0.5˚. might reflect not NAR per se but the lower bound for NAR. Notice that according to the vrsimulations source Mick cites here, NAR is 1.5˚, and given that 2x magnification on top of that is possible, that would be a 0.75˚ maximum, or lower bound. If that's right, it seems more likely that the authors of the Raytheon ATFLIR flier excerpted above simply rounded down from 0.75˚ to 0.7˚ reflecting NAR's maximum magnification potential. In that case we don't have two conflicting sources but two compatible sources. Wrong. Unless your eyes are 100 feet apart. Do it with one eye/camera. And you don't really need anything fancy with relatively small angles. Halve the FOV and you double the size of things. Also google-image of field of view human eye shows many other instances of this display. So I'm not seeing why this implies the eyes are 100 feet apart. 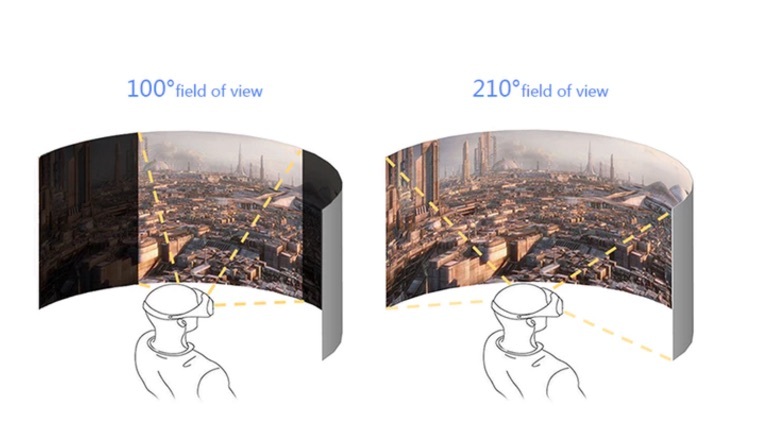 If we were to show the FOV captured in the NAR + 2x screen relative to that head, why would it not be a fraction of 1˚ on that circle? Is the error in the appearance that I'm depicting actual distance? If so, I need to make clear that I'm not. You show converging blue lines from the eyes. In reality the line would almost always diverge, so it's simplest to approximate the human visual system as a single camera. That's a great example, but a graphical metric display strikes me as simpler and more meaningful, more obviously precise to the viewer. What about if I just kill the blue lines from the eyes? re you trying to show they (looking through real eyes) would never be able to find a tiny dot of an object in a big blue sky? The initial size is arbitrary, just like what you might assume,... then the reality. Pretty much, yes. Using the head gives people a sense of 'what it's like relative to my experience'. A fingernail at arm's length, or a 1 cm object held 1 meter away, is about 0.6 degrees. The sun and moon are about half a degree. The object in the Nimitz video was only 1/25 of the FOV. Sit one meter away from the computer screen, and shrink the video to 1 cm. You see what I mean when I say the centroid tracker tends to lock onto hot spots. And the plume is not that visible from the side, compared to the hot engines. I think NAR at 1X zoom is 0.7˚ like the spec sheet said. I don't think they'd list the 2X zoom there. 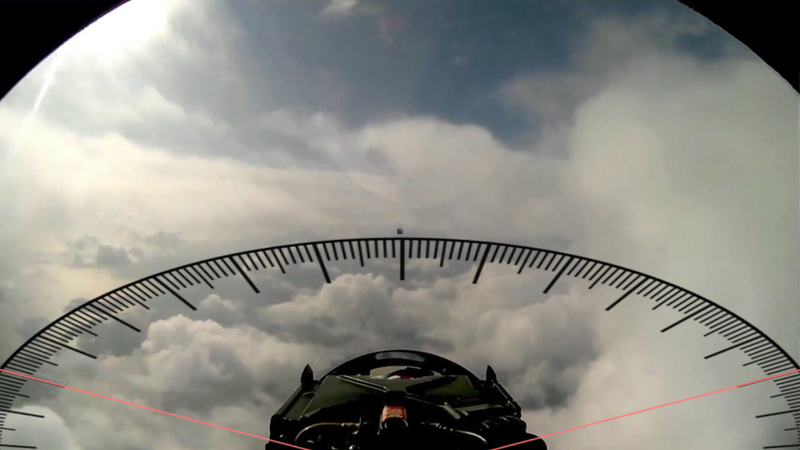 The video shows a Su-27 seen from an F-18. Your video caption has it backwards. That's not what the specs say. "NAR" appears nowhere in the specs sheet. Unless you know of another specs sheet. Thanks! Very important too since then we have exactly the ATFLIR causing an engine-flare rotation. I mistranslated the Russian text for the video. Here's my depiction of the size of the ATFLIR screen and then UFO only @ ~0.75˚ FOV. I had to more than double the size of the UFO just so the least spec would show up, which may be fair as normal visual resolution is finer. Now showing only the UFO and the rest of the ATFLIR screen removed. The screen above was reduced to 1.9% in my video editor to fit into ~0.75˚, I had to increase the size of the UFO from 1.9 to 5% just to get the faintest spec of it to appear. So I'm not yet persuaded that it would be meaningfully visible if at all. I spent a lot of time reading patents and ATFLIR literature trying to refute your take on the ATFLIR's target modeling but, alas, I couldn't. So I have to agree with you. I can't find any support for my original thesis that it models a target in a multi-sensor fashion. Folks not steeped in FOV or ATFLIR FOV settings would, imo, want to see the FOV metrics to understand. Oddly when I make the GIF animation smaller, its file size increases. So I've kept it 1280x720, and that also allows one to see the tiny spec of just the gimbal UFO at the end (click to enlarge). The old spec sheet from 2009 mentioned sensor fusion and an improved EO camera as planned enhancements. Names are arbitrary, hardware is not. I think the specs describe the optics. It would be counterproductive to mix up digital zoom with optical zoom. So, are we going to send this stuff to the New York Times or what? The Daily Express, of all papers, published your debunking of the balloon photo used by TTSA. Shouldn't the NY Times issue some correction at least about the "glowing auras"? They never said they consulted with any experts about the videos, did they? So the 2.0 zoom is purely digital? I prefer to cite what I can directly show (as with the NAR = 1.5˚ FOV reference that expressly stats that) rather than my interpretation of figures that I have to argue for (ie, that the 0.7˚ FOV is that native state of NAR even though the specs don't state that expressly it follows from there being three settings, at least back in 2009). This is a simple question, and my first post here, so apologies if it isn't up to form. But why would it be a problem, or particularly surprising, if the object was an airplane and did actually rotate? Jets can do barrel rolls etc, no?